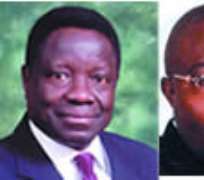 Hopes that a Federal High Court in Lagos would grant bail to the detained directors of the five banks ousted three weeks ago by the Central Bank of Nigeria were dashed yesterday as the presiding judge, Justice Dan Abutu, fixed September 14 and 15, 2009 for ruling on their bail applications. Consequently, the court ordered that they be retained in their respective custody till the dates of the ruling, except for the former Managing Director of Finbank Plc, Okey Nwosu who was transferred from Ikoyi Prisons where he was being detained to the Economic and Financial Crimes Commission detention centre, also in Ikoyi. This is coming on the heels of a fresh suit instituted by 12 prominent shareholders of Oceanic International Bank Plc, including the scion of the Ibru business dynasty Olorogun Michael Ibru against the CBN and its governor, Sanusi Lamido Sanusi, before the Lagos Federal High Court challenging the forceful takeover of the bank. The detainees affected by yesterday's court order include Cecilia Ibru, Okey Nwosu, Sebastian Adigwe and Bartholomew Ebong who were until three weeks ago, the managing directors and chief executive officers of Oceanic International Bank Plc, Finbank Plc, Afribank Plc and Union Bank of Nigeria Plc, respectively. Others are Messrs Raymond Obieri, Hyacinth U.F.Enuha, Ikechi O. Kalu, Christopher Adebayo Alabi, Samuel Adegbite, Alhaji Isyaku Umar, Bayo Dada and Elder Sanni Adams - all former non-executive directors of Intercontinental Bank. The rest include the managing director of Falcon Securities Limited, Peter Ololo and two executive directors of Union Bank, Messrs Henry Onyemem and Niyi Albert Opeodu. At the resumed hearing of the case yesterday, counsel to the EFCC, Abubakar Mahmoud (SAN), who led 10 other lawyers, while opposing the applications of the bank executives for bail, submitted that the offences for which they are being tried are very grave and border on economic sabotage and threats to the economic health of the nation. He also disclosed the preparedness of the commission for the speedy trial of the suspects, praying the court to discountenance claims being made by some defense counsels about the ill-health of one of the suspects. The EFCC lead counsel argued that the suspects are receiving adequate medical attention from the commission. But former Attorney General of the Federation and Minister of Justice, Akin Olujimi (SAN) in concert with Chief Adeniyi Akintola (SAN) and Wale Akoni (SAN) led nine other lawyers to argue bail in favour of Mrs Ibru, while Wole Olanipekun (SAN), Professor Gabriel Olawoyin (SAN), Augustine Alegeh (SAN) and Lasun Sanusi (SAN), led 14 others to defend the bail applications of the seven former directors of Intercontinental Bank. Olanipekun and Anthony Idigbe (SAN) also led 13 other counsel to argue bail in favour of Nwosu while Idigbe and three others led arguments in favour of Adigwe. Femi Falana and three other counsels stood in for Peter Ololo while Professor Alfred Kasumu (SAN), Idigbe and Olanipekun appeared for Ebong and the two directors of Union Bank charged with him. The 15 suspects and one company, Falcon Securities Limited, were arraigned on August 31, 2009 on a 131-count charge bordering on fraud, concealment and the granting of loans without adequate collateral running into about N625.95 billion. The bank chiefs are being held in connection with the insolvency of the five banks they previously managed, necessitating their sack and take over by the CBN three weeks ago. Some of them, especially the CEOs and directors are being accused of failing to give a true and fair view of the state of affairs of their banks to CBN by incorrectly importing false amounts of commercial papers under the Expanded Discount Window of the Central Bank in the statement of assets and liabilities. Proceedings at the premises of the court yesterday were drama-free as the detainees were brought without incident. Mrs Ibru arrived the court alone in an air conditioned bus assigned by the EFCC to convey her to the venue. Unlike her first appearance last Monday, she appeared to be in better spirits and walked unaided into the court room. As the counsels for the defense and prosecution argued their cases for bail, the former managing director of Oceanic Bank was seen shaking her head as if in disbelief over the situation in which she finds herself. Other bank executives along with Mr Ololo, however, maintained their composure throughout the proceedings. As the executives fought to secure their freedom, the shareholders of Oceanic Bank yesterday instituted a lawsuit challenging the take over of their bank by the CBN. They are further seeking an injunctive order barring the CBN, its governor, agents, privies or servants, howsoever, from appointing a new helmsman and non-executive directors for the troubled bank pending the final determination of the substantive matter. The shareholders are K. Ayeye, A. Asalu, Ololade Ogunlusi, D.P. Iyabi, F. Okumagba, C. Mekwunye, Olorogun M.C.O. Ibru, V. O. Ibru, Dr. C.A.O. Ibru, Mas-Mackoy Limited, Meeky Enterprises Limited, Arata Nigeria Limited and the bank itself (Oceanic Bank). Sued alongside Sanusi are the Attorney General and Minister of Justice, Michael Aondoakaa and the incumbent managing director of the Bank, John Aboh. The suit is coming three weeks after Cecilia Ibru was sacked as the bank's managing director by the CBN, two weeks after she filed a separate suit challenging the CBN, and four days after her arraignment in court. The shareholders are contending that Sanusi's action was not only seen as absurd, illegal, null and void and of no effect, but was an affront on their rights as guaranteed under Sections 16 (1)(d), 43 and 44 of the 1999 Constitution. “Our property and/or interests in Oceanic Bank are not subject to the control, alienation, disbursement, transfer, sale, or forceful take over compulsorily by the CBN and Sanusi without our consent and approval,” they argued. In the suit which was filed by their lawyer, Adeniyi Akintola (SAN), they are asking the court to restrain the CBN or any of its agents from interfering in the affairs of the bank, as they are competent to manage and control their funds within the CBN regulations as enshrined under Section 35(2) of the Banks and Other Financial Institutions Act. They are also seeking, among others, the following: “a declaration that the shareholders, being major shareholders, are the core owners of Oceanic Bank alongside other shareholders whose rights and/or interests in same are protected by the provisions of Section 44 of the 1999 Constitution. “A declaration that the property and/or interests of major shareholders in the bank are not subject to the control, alienation, disbursement, transfer, sale or forceful and compulsory takeover by the defendants without the consent or approval of the plaintiffs.